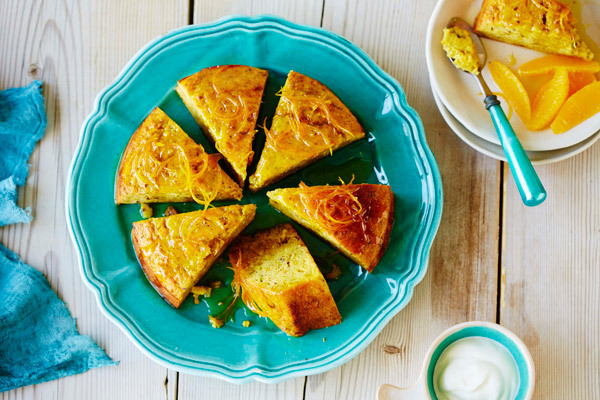 A light and zesty cake full of flavour! Place oranges in a saucepan and cover with cold water. Bring to the boil, reduce heat and simmer, covered, for 1 hour or until very tender. Drain. Cut top and bottoms from oranges and discard. Cut oranges into large chunks and discard pips. Preheat the oven to 180°C/160°C fan-forced. Lightly spray a 20cm cake tin with oil and line with baking paper. Blend pistachios in food processor until finely ground. Set aside. Place chopped orange in food processor and blend until smooth. Add sugar, eggs, flour, baking powder and cardamom and blend for 30 seconds or until smooth. Fold in ground pistachios. Spoon mixture into prepared tin and bake for 40-45 minutes or until cooked when tested with a skewer. Cool in tin for 10 minutes. For the syrup cut julienne strips of rind from the orange using a zester. Juice the orange (you need about 1 cup/250ml of juice). Place orange juice, rind and sugar and 1 cup (250ml) of water into a saucepan. Cook, stirring, over a low heat for 2 minutes or until sugar dissolves. Increase heat to high and cook for 2 minutes or until syrup thickens slightly. Spoon hot syrup and rind over warm cake. Serve with yoghurt and fresh orange segments.